Obetz encourages the use of low impact development for all new construction and redevelopment projects. Low-Impact Development (LID) is a form of stormwater management that focuses on retention, detention, or infiltration of rainfall and snowmelt to maintain a natural water balance. Rather than treating rainfall as a waste to be channeled quickly off-site and conveyed through pipes to ponds or basins, rainfall is allowed to soak in. LID is often accomplished by using vegetated areas. Plants slow the movement of water through an area, and their roots move water into the deeper soil layers. LID also increases on-site water filtration and helps to clean excess runoff. 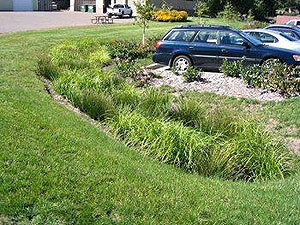 Bioretention basins are landscaped depressions used to slow and treat stormwater runoff. Stormwater is directed to the basin and then filtered through plants and soil before it ultimately reaches a larger body of water. Bioretention basins help improve water quality because they remove pollutants from stormwater through infiltration and plant absorption and they reduce water runoff. 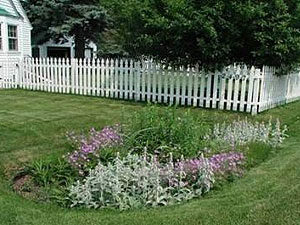 Grassed swales allow runoff to percolate into the ground, reducing the amount of runoff leaving the property. Check dams can be used within a swale to slow the flow rate, promote infiltration, and create small, temporary ponding areas. The vegetation covering the side slopes and channel bottom provide a filtration surface for the water. The vegetation also helps to reduce the flow velocity. Green roofs are roofs that are partially or completely covered with vegetation and soil. Green roofs offer many benefits, ranging from reducing stormwater runoff to filtering pollutants and carbon dioxide out of the air. In the summer green roofs retain 70%-90% of the precipitation that falls on them, thereby lowering the amount of stormwater runoff. (In the winter they retain 25%-40%.) 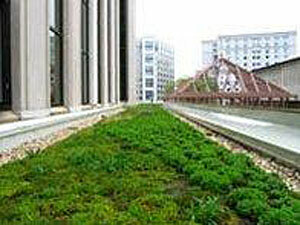 In addition, green roofs filter pollutants and heavy metals out of the rainwater that does become runoff. Landscaping with native plants helps with stormwater management because native plants don’t need as much fertilizer or pesticide to thrive. This means that when it rains, fewer chemicals are channeled into the nearby waterways, which leads to healthier and cleaner streams and rivers. 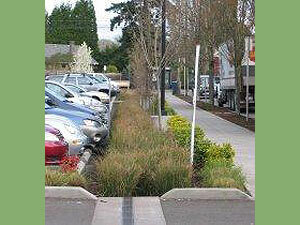 Parking lot filter strips are low-angle vegetated slopes designed to filter runoff from adjacent impervious areas. They pretreat the runoff by trapping and filtering pollutants. They also increase infiltration of stormwater runoff and help reduce runoff velocities. Pervious pavement has more air spaces than regular pavement, allowing water to drain through the surface into the underlying soil. This helps recharge groundwater and reduces the amount of stormwater runoff. 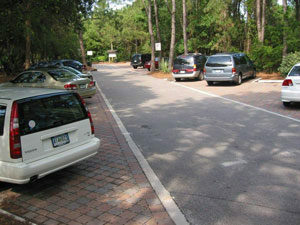 Most current pavements, such as parking lots, are impervious. That means all the oil, anti freeze, and other automobile fluids are washed into local waterbodies when it rains instead of being absorbed into the ground. 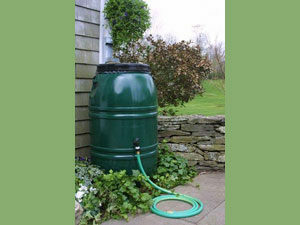 Rain barrels are containers or systems that collect and store rainwater from rooftops for later use. They provide valuable and useful opportunities for water conservation. They also reduce the amount of stormwater runoff, which is frequently channeled into nearby streams and rivers while carrying pollutants and other contaminants. 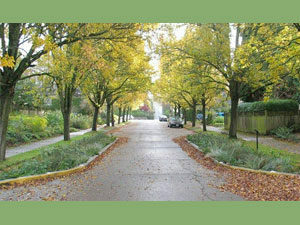 Rain gardens are landscaped areas filled with native plants to replace areas of lawn. They are planted in low-lying areas and contain specific layers of soil, sand, and organic mulch. When it rains, the garden fills up with a few inches of water and then allows the water to slowly filter into the ground rather than running off to a storm drain. When compared to a conventional lawn, rain gardens allow about 30% more water to soak into the ground. The different layers of the rain garden naturally filter the site’s runoff, substantially reducing common homeowner pollutants such as lawn fertilizers and driveway oils. In that way, they provide protection for the receiving waterways. 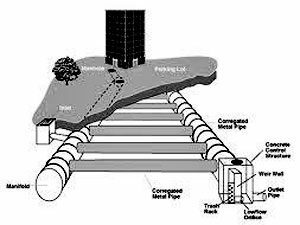 Underground storage allows for the storage of collected stormwater runoff beneath the ground. The stormwater is stored only temporarily until it infiltrates into the underlying soil or discharges out of the system through a controlled outlet. This practice allows suspended pollutants to settle and reduces the velocity of runoff flow. Infiltrating stormwater recharges the groundwater and reduces the amount of runoff. 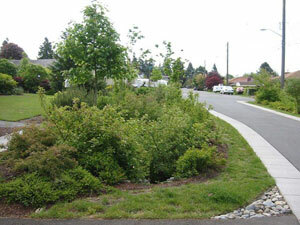 Curb Extensions and bioretention swales are small stormwater facilities that treat drainage near the source of runoff. They can be placed within the road right-of-way as they can be located between the curb and the sidewalk; sometimes curbs are extended into the parking lane and pavement is removed to widen the available footprint and treatable drainage area. These facilities filter water through a mixture of highly permeable soils (sand, mulch, compost), then store water in an underlying gravel layer from which the water percolates into groundwater. These systems ultimately improve receiving stream and watershed health by improving water quality, reducing storm runoff and recharging the water table.